Tubbs, a totally huggable pittie, has been waiting at the shelter so long that his fans there are starting to get worried - and they're doing everything they can to find him a new home. Tubbs was abandoned on the shelter's doorstep almost two years ago, on September 25, 2013, according to the Santa Barbara County Animal Services' Facebook page. Now the shelter is desperate to find him a home before the two-year anniversary of his abandonment. "He's super laid-back," Stacy Silva, the shelter's community outreach coordinator, told The Dodo. "Just wants to love." The shelter uploaded a photo of Tubbs to its Facebook page on Saturday, joking that the black and white dog isn't a pit bull ... he's an "8-year-old giant Boston terrier." "Please don't tell him he's a pit bull," the shelter posted. "Not that there's anything wrong with pitties, but he thinks if he's called a Boston Terrier (and he really does look like one) then maybe someone will let him come home with them." Sadly, Tubbs' breed may be one of the things holding him back from finding a new family. Despite the fact that pit bulls, like all breeds, can be loving family pets, unfair discrimination often keeps them waiting in shelters, passed over again and again. Some estimates suggest that at least 2,800 pit bulls are euthanized each day. 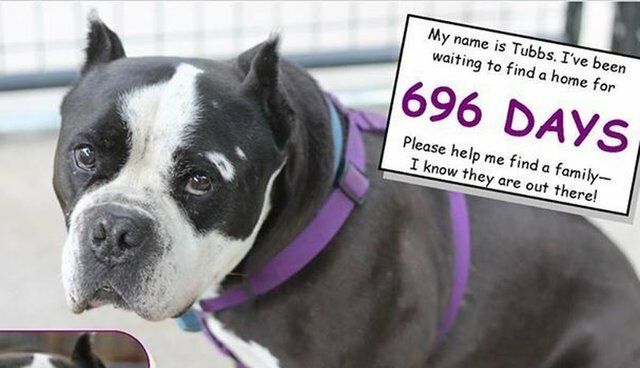 Tubbs has been waiting almost 700 days for a new family - even though he's a "perfect gentleman" and "has not met one person that he doesn't adore." Fortunately, social media can be a literal lifesaver for dogs like Tubbs. "We don't have any applications on him," Silva told The Dodo. "We're very hopeful that the power of social media will result in him finding a forever home." Hopefully the perfect family is out there, and, with a little luck, they'll see his photo and fall in love.